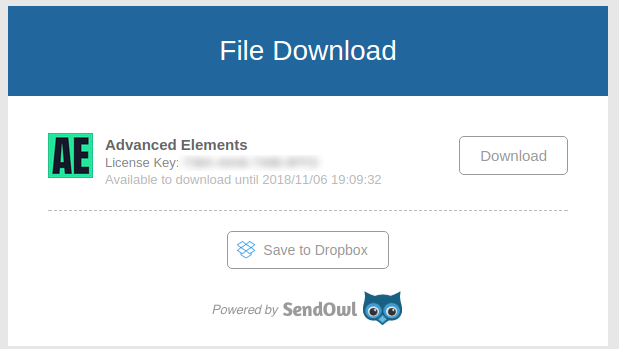 After you have purchased the plugin you will get an email from SendOwl with a download link and license key. Clicking the link will take you SendOwls website where your purchased products will be listed. Click Download on the row with Advanced Elements to download a zip file with the latest version of the plugin. After download is complete upload the plugin and activate the standard WordPress way. This is all that is required to start using the plugin. After activation a notification will be displayed asking you about installing and activating Goose Studio Settings. If you wish to enable update notifications and automatic updates you need to install and activate Goose Studio Settings. Click the link to get to the download page. This plugin will also at later time give you direct access to plugin documentation and more from within your site. Go to Goose Studio Settings Installation Guide to see how you install and configure automatic updates and more. After activating Goose Studio Settings you can reach the Settings page on the plugin page.